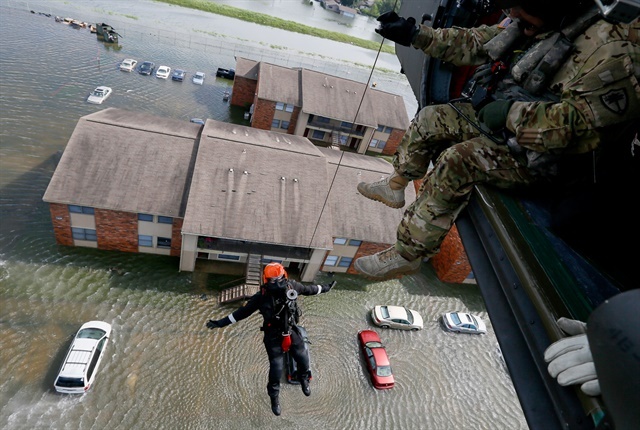 Photo of flooded vehicles in Houston by the Texas Air National Guard. Hurricane Irma was comparatively milder to the hurricane that flooded many parts of Houston. The bulk of the damage that Florida sustained from the hurricane was caused by wind with only minimal flooding, meaning that it is expected that fewer vehicles will be declared total losses as a result of Hurricane Irma. Online auction company Copart expects that it will process roughly 7,500 additional salvage vehicles as a result of Hurricane Irma. The additional volume due to Hurricane Irma will be pretty negligible to the Florida auction market; given that on average the company processes approximately 150,000 salvage vehicles a year in the state, noted Copart CEO Jay Adair. John Kett, CEO and president for Insurance Auto Auctions (IAA) told Vehicle Remarketing that it’s still too early in IAA’s recovery process to give an expected number of vehicles its auctions will take in as a result of Hurricane Irma. However, he did note that the company is expecting it to be a smaller event than Hurricane Harvey. Many people are still in the process of returning to their homes in Florida and have not filed a claim to their insurance provider. If an insurance company doesn’t have a claim filed then it cannot send an assignment to IAA to go recover a vehicle from a policy holder. As Florida residents return to their homes and begin filing their claims, IAA will then be able to form a clearer picture of just how many cars it will be taking in, said Kett. IAA and Copart locations suffered minimal or no damage. They were able to resume operations immediately following the storm. They did have to run their buildings on generator power for a small amount of time. While the effect that Hurricane Irma had on the companies' operations in Florida was relatively mild, Houston was a different story. A large percentage of the Houston was in multiple feet of water, opening the door to much more cars suffering flood damage, which in turn increased the forecast for vehicles heading to salvage auction when compared to Florida. Kett said that IAA doesn’t have a completely accurate number just yet, due to similar reasons noted for Florida, but it can say that it expects the number to be near what was collected from Hurricane Sandy. In Houston, Adair told Vehicle Remarketing that Copart expects somewhere in the range of 85,000 vehicles. “It’s a pretty major event for Houston, to say the least,” said Adair. This rise in volume is poised to double the amount of vehicles that Copart typically sells in Houston, given that on average the company sells 60,000 units a year in the city. While the effects of Hurricane Harvey will definitely be felt in Houston, Adair doesn’t think that the effects of both Hurricane Irma and Harvey will have much of an impact into the overall salvage industry. The salvage market sells about 4 million cars every year, and the additional volume brought by the two hurricanes just won’t have any noticeable effect, he said. The real challenge brought forth by the increased volume, specifically in Houston, is the logistical nightmare that is collecting and storing all these cars. “In Houston it’s more of a logistics thing. Having the land, the trucks and the logistics of getting the vehicles picked up when you’re not used to doing that kind of volume. You have to ship trucks in from around the country, fly people in from around the country and house them. It’s a massive logistics play but nothing Copart can’t handle, and so far we’ve picked up about half [our projected] volume,” said Adair. Florida, he added, will be added work, but won’t cause too many logistical issues. Copart has enough real estate to store 50,000 additional vehicles; the 7,500 expected vehicles in that state won’t be a problem, Adair said. IAA secured additional real estate in Texas and in Florida earlier this year and has been working to secure additional land as soon as it heard that hurricanes were headed toward those states. IAA has also been able to leverage the KAR family of companies to provide additional real estate when needed, said Kett.